The story that John Davis tells in this book falls under the category of “truth is stranger than fiction.” Who would believe, outside of a fable or maybe a joke, that in Fascist Italy a group of several dozen Catholic peasants would spontaneously decide to convert to Judaism; that they would persist in calling themselves Jews even as Italy introduced Nazi-style anti-Semitic laws; that they would make contact with Jewish soldiers from Palestine, serving in the British Army that invaded southern Italy during World War II; and that finally, after two decades of dedication and hardship, they would undergo ritual circumcision and emigrate en masse to the newly created state of Israel? Yet it all really happened in the town of San Nicandro in the impoverished, isolated Gargano region of southern Italy. According to Davis, the Jews of San Nicandro represent “the only case of collective conversion to Judaism in Europe in modern times.” Why did it happen just then, at the darkest hour for European Jewry, and in a region where no actual Jews lived? The answer lies in the religious genius—or madness—of Donato Manduzio, the founder of the San Nicandro group. Born in 1885, Manduzio grew up in the extreme poverty typical of southern Italy at the time, and never went to school. Of his childhood little is known, except that his father gave him the nickname “Shitface” (“although to judge from an early photograph,” Davis objects, “he seems to have been quite good looking”). His first exposure to the wider world came during World War One, when he was conscripted into an infantry regiment and contracted a disease that left his legs paralyzed. Accordingly, Manduzio, who now used the name Levi, set about converting a small number of his neighbors—initially, nineteen adults and thirty children—to his self-invented Judaism. He told them not to eat pork and not to work on Saturday—rules that, in his time and place, he had much difficulty enforcing—and ordered them to give their children Biblical names: Sara, Ester, Myriam, Gherson. The question of naming, in fact, led to one of the group’s most serious schisms. When Concetta di Leo, Manduzio’s favorite disciple, gave birth to a son, her husband wanted to name the boy Vincenzo, after his own father; but Concetta insisted that he be given the name of a Biblical prophet. (They compromised on Giuseppe, or Joseph.) This episode gives a sense of how totally Manduzio dominated his little sect. Paralyzed and bedridden—in all the time he led the Jews of San Nicandro, he never left his house—Manduzio relied on visions and dreams to communicate with God, and laid down the law in a way that his followers increasingly resented. Eventually Angelo Sacerdoti, the Chief Rabbi of Rome, entered into correspondence with Manduzio, but he remained wary. “You and your companions have often expressed your desire to convert to Judaism,” the rabbi wrote, “and I have always made it clear how much this amazes me. I have asked you many times how you came to this conviction, since you have had no previous contact with Jews and know very little about what Judaism is.” Sacerdoti also referred to “spiritual tendencies that had nothing to do with Judaism,” and it is unmistakable how deeply Manduzio’s language and thinking were infused with Christian concepts. His Sabbath service, for instance, involved reading a passage from the Pentateuch and singing the Paternoster, a Catholic prayer in Latin. How could it have been otherwise, since Catholicism was the only religion he ever knew? But the sannicandresi were persistent, and in time their sincerity began to win over members of the Jewish establishment. At this point, Davis’s story begins to broaden into a larger portrait of the Italian Jewish community—a small and highly assimilated group, whose relations with the Fascist regime were mostly good until the late 1930s. Prominent Jews took an interest in San Nicandro—especially the small but influential community of Italian Zionists, who found the devotion of these self-made Jews an excellent example for Jews at large. One of their major patrons was Raffaele Cantoni, a brave anti-Fascist whose work on behalf of Jewish refugees before and after the war put him in a good position to help the Jews of San Nicandro. Much of the later part of Davis’s story unfolds through Cantoni’s correspondence with his proteges, as he tries to balance cautious support with impatience at their infighting and demands for help. The war, which might easily have meant the end of the Jews of San Nicandro, actually turned out to be the making of them. Donato Manduzio’s house happened to be located on a highway used by a transport unit of the British Army, which occupied the region after September, 1943. That unit, Company 178, was composed of Jews from Palestine who had enlisted in the British Army in order to fight Germany. (Their commander, Major Wellesley Aron, is one of several fascinating Jewish figures in Davis’s story.) When their trucks, painted with the Star of David, drove through San Nicandro, the local Jews greeted them with their own Star of David flag. In this way, Davis shows, the sannicandresi came to the attention of the network of Jewish activists—Italian, Palestinian, and British—who organized throughout Italy to shelter Jewish refugees and smuggle them to Palestine. The Jews of San Nicandro were especially inspired by their meeting with Enzo Sereni, an Italian Jew who was a leading Haganah activist. The photo of Sereni in San Nicandro, surrounded by solemn-looking men holding the Zionist flag, was the last taken of him, before he parachuted behind German lines on a mission that led to his death. As a consequence of these experiences, the home-made Judaism of the Jews of San Nicandro grew into a passionate Zionism. 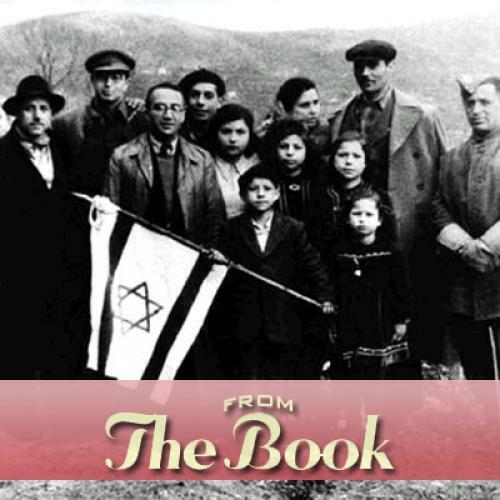 From 1944 on, the community’s goal was to emigrate and build the Jewish state. This was by no means easy, as the patient Cantoni kept reminding them: the British were intent on keeping Jewish immigrants out of Palestine, and the few available permits were meant for Holocaust survivors, not the comparatively well-off Jews of San Nicandro. Yet in November 1949, after a series of clashes that Davis documents—and after the death of Donato Manduzio, who grew increasingly alienated from his flock—the Jews of San Nicandro did make aliyah. Davis writes only sparingly about their experience in Israel, which was apparently as difficult as that of most immigrants to the new country. But perhaps this very hardship was the best proof that they had achieved their extraordinary goal of becoming ordinary Jews. Adam Kirsch is a senior editor at The New Republic. This piece originally featured in Tablet.